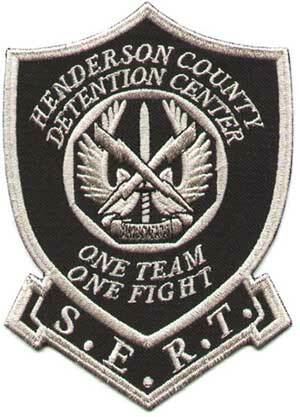 In the event of an emergency situation that requires a quick and definitive resolution the Henderson County Detention Center will employ the services of their Special Emergency Response Team (S.E.R.T.). The members of this team are highly trained and skilled to deal with high risk situations or catastrophic events. All SERT members have received certification from the Department of Corrections for specialized training in multiple areas regarding correctional security. Some of these areas include firearms training, defensive tactics, chemical munitions, and verbal deescalation techniques.